Reacting mantle min’rals out of sight? So now lemmings can lounge on both the north AND south sides of Lake Burley Griffin. I keep losing the link to the Supplementary Information from my Geology paper (summarized as Geosonnet 42), so I'm posting the direct link here, where I hopefully won't lose it. And before you tell me a better way to keep track of things in the digital age, GET OFF MY LAWN! This rocking BIF precipitate was grand. With carbonate fade in- not acid- bass. The iron oxide satisfied demand. I wrote last year about the big trees of the Sierra Nevada mountains in California. One if the things that interested me was the ability of the Sequoia and the Sugar Pine to grow side-by-side, despite having very similar survival strategies- namely grow taller than everything else and live long enough for fire to clear our the shade tolerant trees so that your seeds can germinate. 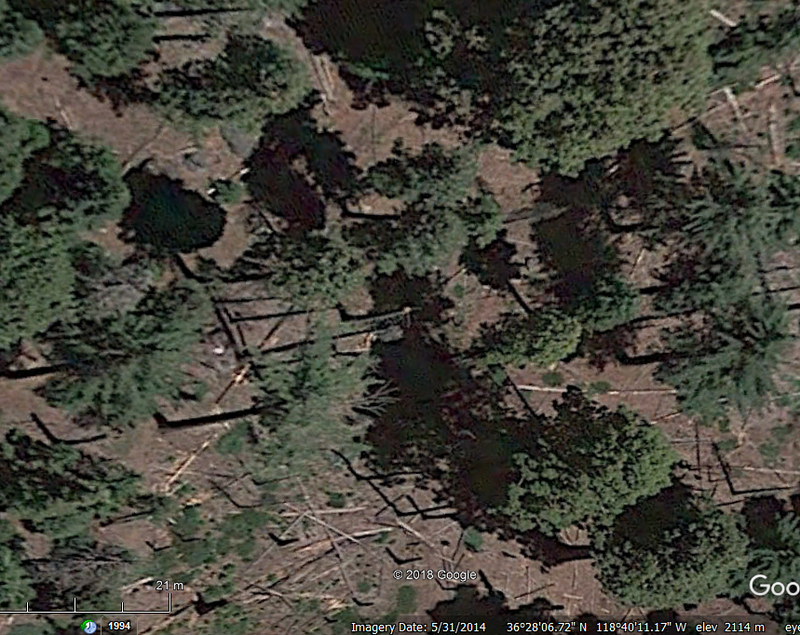 You can clearly see the long lateral branches on the pines (which also have somewhat bluer foliage). The larger, yellower trees with very wide trunks and rounded foliage are the sequoias. 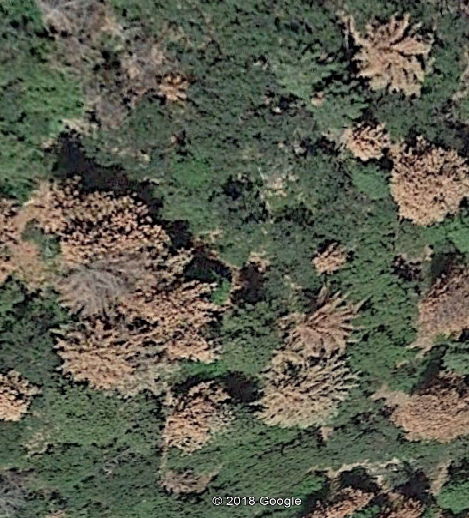 The most obvious thing here is that the Sugar Pines are mostly dead. But there are other differences. Unlike in the National Park, here you cannot see the ground- the trees are growing too close together. One critique of the Forest Service is that it as lagged behind the Park Service in the use of controlled burns and recurrent fires. While I don't have the fire history of this exact area, the much thicker understory could be the result of decades of fire suppression. And if those trees are sucking up all the water, perhaps that has stressed the pines. The Great Way is an epic Fantasy Trilogy by Harry Connolly. As the first two books end in cliffhangers, and the narrative immediately picks up afterwards, it is useful to look at them as volumes of a single story as opposed to related independent books. Luckily, the story is very good. The story opens in the capital of an empire similar to Imperial Rome. Unlike the Romans, however, the Perdaini empire has a caste of scholars, whose sorcerous power is derived from ‘gifts’ brought by God-like- or alien-like beings. Once a generation, these beings visit, and this time, the visit goes terribly wrong. A plague of ravenous beasts descends on the capitol, slaying the emperor and ravaging the city. The crown prince and a small portion of his entourage escape, including the two very different POV characters: The first is Tejohn. An aging war hero who won fame and renown hunting down rouge scholars and quelling rebellion, he is the Prince’s bodyguard. The second is Cazia Freewell. The teenage daughter of a rebellious lord, she is kept in the imperial court as a hostage, where she is raised in the imperial culture and is studying to be a scholar. Despite their differences and hatred of each other, the POV characters are united in their desire to preserve the empire and protect the Prince, and they soon split up to run separate quests for him. As the plague spreads and the story progresses, however, the goal slips from maintaining the empire, to survival, of the characters, of civilization, and even of humanity itself. As a fantasy adventure, this is a fast-paced, hard-hitting, and creative story. And I recommend it on that basis alone. But there are additional attractions that the story has to people of science. Just as clearly, she sees the fear, greed, and cunning that the rest of society feels when they realize she- like modern atomic scientists- can see and do things outside of the ordinary experience of most humans living their day to day lives. As the story takes place in a collapsing civilization, this is all the more important for all of us to appreciate. This is a brief note on the recent Science Advances paper on the Hiawatha Impact crater, a large, recent crater which lies under the Hiawatha glacier in extreme northern Greenland. In the past, I have bagged out impact crater scientists and being alarmist and even dangerous. However, this discovery is the real deal. Similarly, I have occasionally criticized the “glamour-mag” approach to scientific publication, but in this instance, a big splash is appropriate, because it is a big deal, and the evidence is overwhelming. The short version: Ice penetrating radar and analysis of glacial outwash sand show a large (31km diameter), recent impact crater under a Greenland glacier, complete with central peak. The outwash shows shocked quartz, probable melt glass, and PGE anomalies consistent with an iron (or stony iron) impactor. This is not one of those ancient, deformed, maybe-if-you-squint-you-can-see-a-circle crators, this is in your face and completely obvious to anyone who has studied even a little geology. This is a recent discovery because of global warming! Prior to 2012, the outlet glacer emptied into a lake. It is only ni the last 6 years that it has retreated onto land, so that the sediment they sampled and found the shocked quartz, impact glass, etc in was only exposed from beneath the melting ice sheet a few years ago. They are planning on running conventional gravity surveys to look for rebound, but because all the ice is melting, the melt signal dominates the GRACE gravity signature. No known impact ejecta is known from any of the North Greenland ice cores, making the crater likely to be older than the oldest of them (about 100ka). Ice cores are regularly checked for volcanic debris, and it is unlikely that they would miss something this large and close (quick math suggests the ejecta volume should be about 200-600 km3, making it a medium to large VEI-7 equivalent). The crater overprints pre-glacial river valleys, and this is (as the authors state) probably Pleistocene in age (10ka-2.5Ma). The melt glass should be datable via Ar/Ar dating, but it is not clear if they have recovered a large enough volume of the material to date at this stage. I would expect a tektite field from an impact this size, but it isn’t clear where those tektites would end up. If they fell on ice (By definition, the Arctic was mostly ice-covered during most of the Pleistocene), then they would get carried to a moraine (on land), or float around until the ice was exported through the Fram Strait and melted somewhere in the NE Atlantic Ocean. There is a controversial Younger Dryas impact hypothesis, which basically calls for an Arctic impactor as a trigger for the Younger Dryas cooling and extinction of the Clovis culture in North America. I would be careful connecting this crater to that event, as the NEEM ice core, less than 400km away, doesn’t have any reported ejecta, as known tephra are mostly basaltic. Finally, they report carbon in the silicate impact melt. That seems odd to me, as neither crustal gneisses nor iron meteorites have much carbon. they should do ion probe d13C to get the isotopic composition. Who knows, maybe the impactor hit a peat bog.